Juicy strawberries and soft mozzarella. 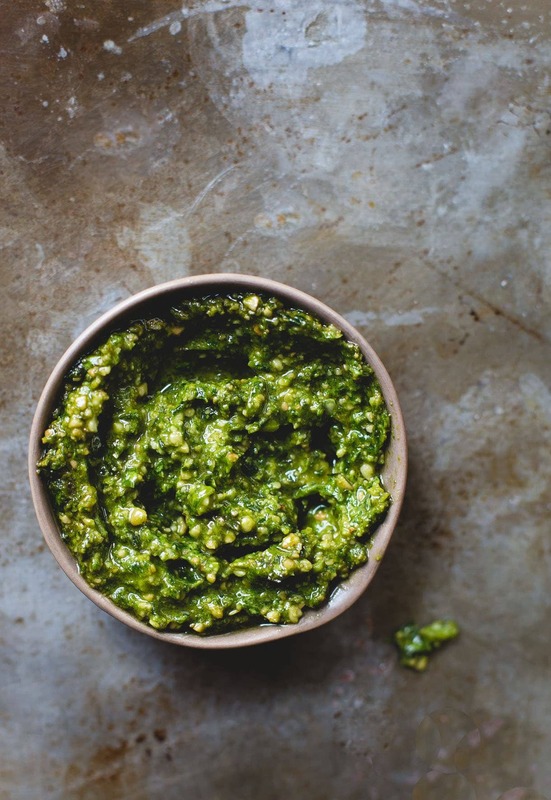 Herby pesto, with pine nuts and cashews. Simple food that fills our bellies on a hot summer night, crickets singing a love song, white wine in hand. Life doesn’t always look like that, but tonight it does. Brian and I took off on a whim this week, and rented a small cottage in the middle of Minnesota bluff country. (You can catch the behind the scenes on snapchat, i’m @heartbeetkitchn – no e at the end.) To work and play, to cook, to let our minds wander, and continue to dream about our plans to someday make such a place our home. Every day, I’m thankful we’ve taken the chance to live in a non-linear fashion. It wouldn’t work for a lot of people, but it does for us. There has to be a lot of give and take, understanding, open conversations, and disagreements. We’ve started drawing up plans, and are looking at different areas that would fit our style. Not completely remote, because this girl needs to be within a half hour of a good grocery store, and he needs to have a local watering hole to chum up conversation over a cold beer. I want cats, chickens, and goats, plus a garden — he wants a work shed and tools. Small and minimalist, yet functional and modern, with a dusting of vintage. And ideally a tiny guest house sitting next to ours, so we can share our place with other people, like you. I don’t know if it will take us five years or ten, but as the vision comes together, I’m starting to picture what life would look like. Part of this recent push to get things moving comes from feeling so inundated every day with stimulation overload. I often wonder what it was like long ago, when there wasn’t constant “checking in” on social media, to not have pinterest as your answer for how to do anything, or have anything you need delivered to your door thanks to Amazon. 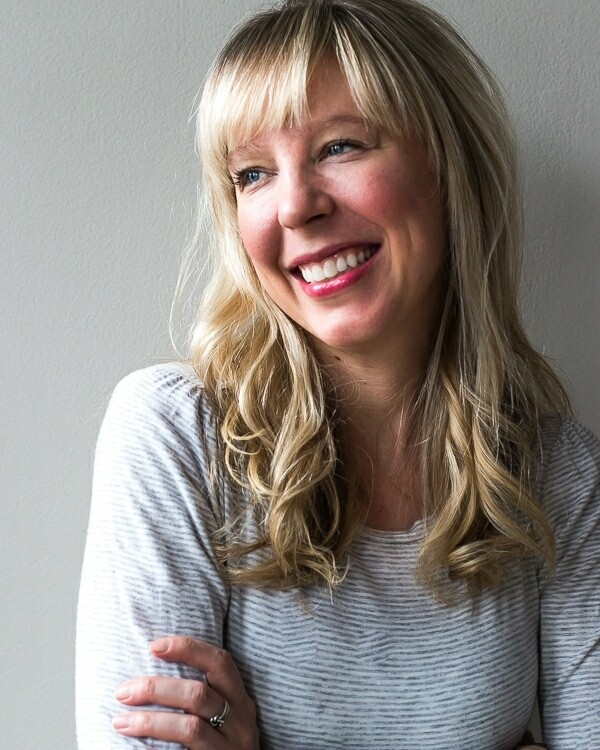 What was it like to have days comprised of just thought and reading, or trying things that were completely foreign, but you needed to solve a problem? Or walking scones to the neighbors, and sitting and talking for hours instead of minutes about things bigger than you? Certainly I’m grateful for the very advanced world we live in today, but I think the resurgence of “vintage lifestyle”, goes deeper than it being “the cool” thing”. We crave a simpler life built more off of experiences and people, but actually embracing both instead of trying to capture the moment for social media. It’s days like today where I find myself feeling most fulfilled. I didn’t do much, but at the same time I did everything. I cleaned and tidied the cottage, took a hike, made three meals including this Strawberry Pesto Caprese Salad, worked (which yes – did include answering emails), fed the animals, and we talked without distraction. I want that, more than every so often. But I also know you can’t just want and wish. It will cost money, it will involve hard work, and it will take time. And it will take him and I, hand in hand, to make the life we want, a reality. 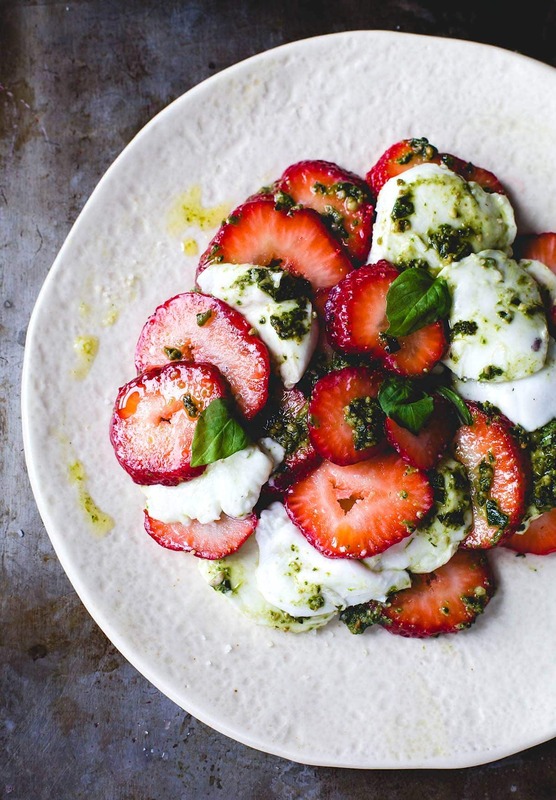 Now about this caprese…….. Before strawberry season passes, you must make this simple beauty of a salad. I’ll admit, our local coop makes an amazing pesto with cashews and pine nuts that I can’t quite recreate at home so I use it as our house pesto. Go ahead and use your favorite too! Take that semi-homemade theme and run with. There are only three ingredients (another Friday Five with less than five ingredients, ya!) 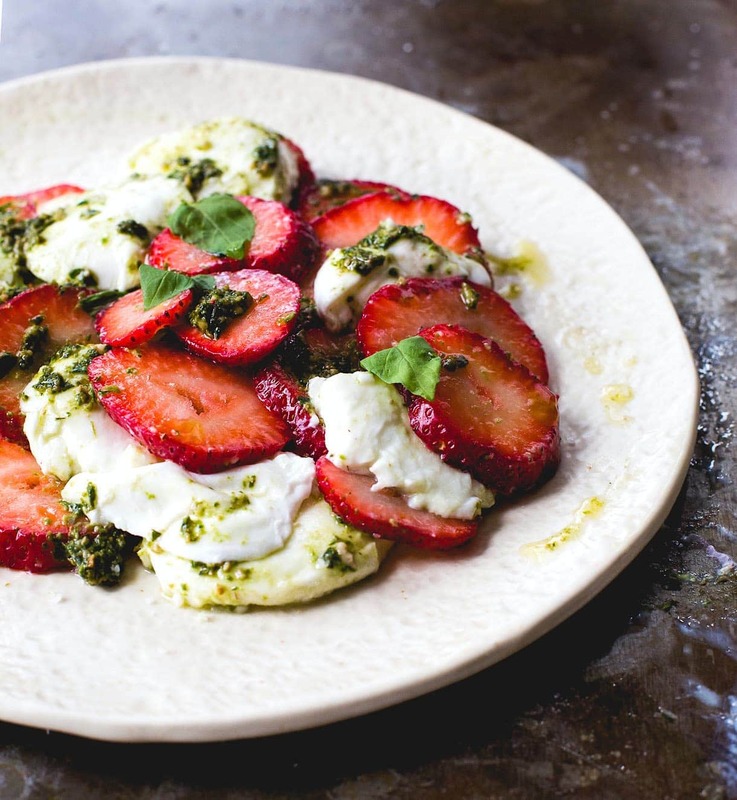 to this tomato-less caprese: sweet and juicy California Giant Strawberries, fresh mozzarella, and that herbalicious coating. The combination is stellar, and perfect for sharing at an outdoor barbecue, pool party, or your own cabin getaway. Thanks to California Giant Berries for sponsoring this post, whom I’m proud to be an ambassador for this year. 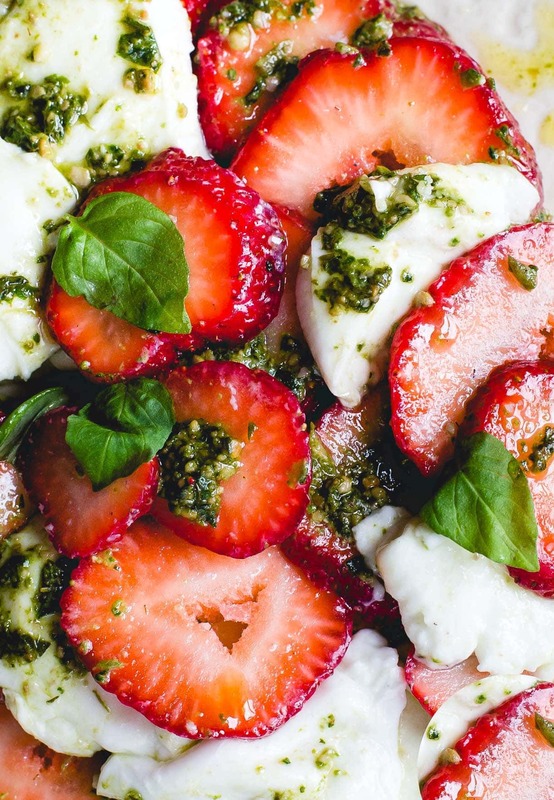 Put strawberries and mozzarella in a bowl, sprinkle with ¼ teaspoon salt. Add pesto, and gently stir to coat, using hands if needed. Pour onto a plate, and drizzle with olive oil to serve. Ah, living a vintage lifestyle would be so beautiful! I also want to live a fairly minimal lifestyle with lots and LOTS of travel–but I have to live nearby a grocery store for sure! 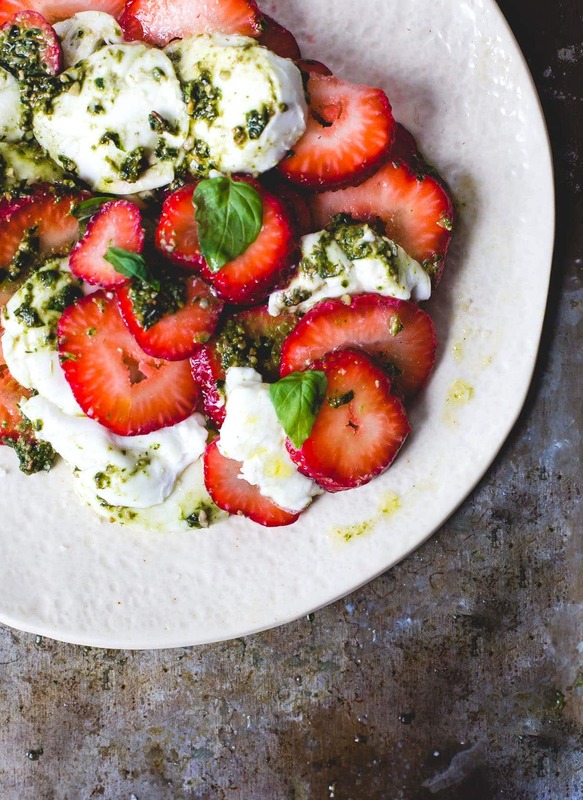 Definitely loving this strawberry pesto caprese salad too. It’s stunning! I’m a little in love with this series, lady. 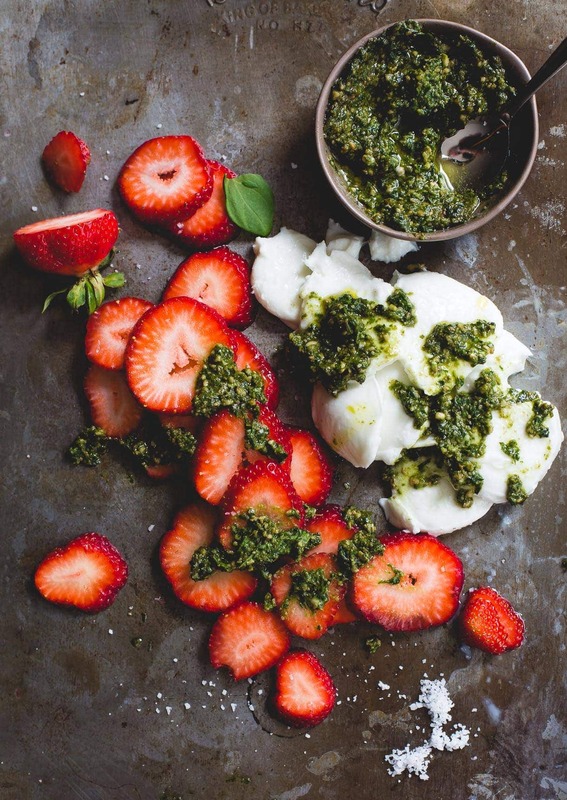 And that pic of the berries and mozz just tumbled out with the pesto over top has my heart fluttering – gorgeous. aw, thanks Em! i like simple things…. that taste bomb. five ingredients and one bowl for the win. Love tha way you think! Recently on our road trip and passing by yellow stone I say small cottages in the middle of nowhere which made me think how different are their choices – choices I might want to consider one day, to be in a quite place , instead of running all day thinking about making it bigger and bigger – enjoying small things in life! I miss those days when I was a kid and summer evenings used to be filled with family and fun games and food. Love hearing about your cottage dreams! It sounds heavenly and I often contemplate the same thing – finding balance in this over-stimulating world of ours! So glad you guys got to get away – we feel similar so often. The cabin you stayed in looked absolutely dreamy and I can’t wait to see your cottage plans unfold in the future! This sounds so good! It’s the perfect Summer recipe!